Red outlining shows where proposed National Recreation Area would overlap City of Monrovia boundaries. Click picture to enlarge. 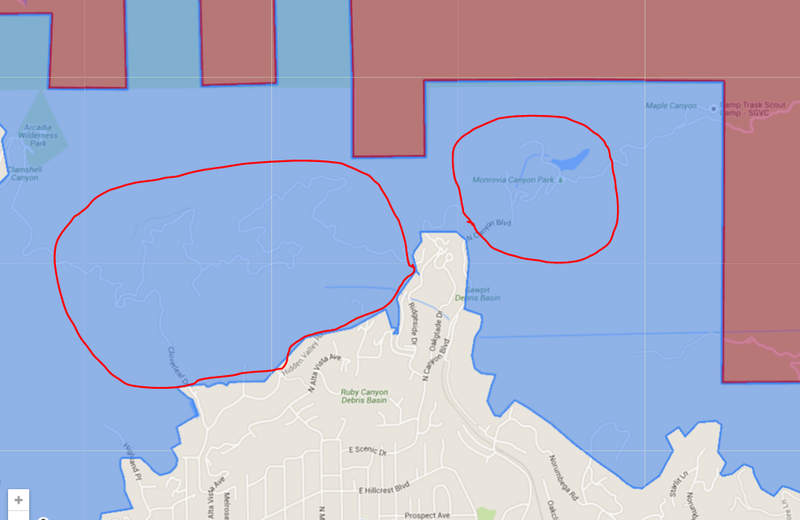 The National Recreation Area, which Representative Judy Chu has again introduced into Congress, would overlay part of north Monrovia, including all of Monrovia Canyon Park and most or all of the Hillside Wilderness Area, as well as several residential streets. "Establishing an NRA along the Foothills and San Gabriel River corridor would enhance conservation, increase access for all communities by connecting park poor areas to open space, and improve the management of the area through improved resources, education, and public engagement." The Monrovia City Council opposed a previous version of her proposed National Recreation area, as it, too, would have overlayed part of the City of Monrovia.